For Maria Kirilenko reaching her first final of 2010 was a wonderful accomplishment. Moreover, doing so in her hometown was particularly gratifying. 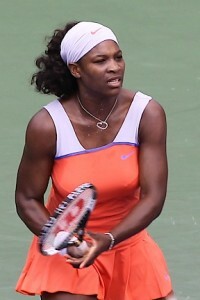 Thus, with a partisan crowd firmly behind her, it was the ideal setting for Kirilenko to terminate a two year title drought. Unfortunately, Kirilenko’s opponent and doubles partner Victoria Azarenka did not cooperate. Azarenka, the second seed, bested Kirilenko 6-3,6-4 to take the Kremlin Cup title, the fifth of her career. With Kirilenko dumping a backhand into the net, Azarenka broke to start out the match. However, Kirilenko wiped away game point and by provoking a few errors from her rival manufactured a couple of break points. Kirilenko capitalized when Azarenka double faulted. Later though at 2 all, as Kirilenko’s forehand up the line sailed long, Azarenka had triple break point. Azarenka converted when Kirilenko’s backhand directed down the line found the net instead. Then, with a forehand up the line winner on game point, Azarenka consolidated for 4-2. Down the road, with a love game, Azarenka extended her lead to 5-3. Next, with a forehand up the line winner, Azarenka got to double set point. By connecting with a backhand down the line winner, Azarenka took the first set. Nothing is impossible! This was the phrase on the t-shirt worn by Francesca Schiavone’s family and friends today in the French Open final. Schiavone proved the axiom by surprising Samantha Stosur 6-4, 7-6 to grab her first career major. Moreover, Schiavone stenciled her name in history by becoming the first Italian female to prevail at a major. With eight first serves leading to two love games, Stosur was on a tear to open the first set. Still, Schiavone had no trouble keeping up, connecting on an ace to level things at 2 all. Subsequently, with a deep return, Schiavone provoked Stosur into a forehand error for love-30. However, with her saving grace, the serve, Stosur battled back and capped the game with a forehand down the line winner for 3-2. Using her all court game, especially the volley, Schiavone stayed in touch with Stosur. The pivotal point arrived at 4 a piece. By pushing her rival into three uncomfortable shots which misfired, Schiavone manufactured triple break point. After Stosur salvaged two, she double faulted on the third to give Schiavone a 5-4 advantage. By climbing out of love-30 with an ace and forehand crosscourt winner, Schiavone set up a second set point with a backhand volley winner. When Stosur netted the backhand, Schiavone claimed the first set. With a deep and low backhand pass, Schiavone caused Stosur to hit the next stroke long. As a result, the Italian had double break point in third game of the second set. However, with a three winners and an unreturnable serve, Stosur guarded serve for 2-1. Then, by punishing second serves, Stosur had her first break point of the day with a forehand up the line winner. Stosur capitalized when Schiavone’s forehand up the line failed. Promptly, Stosur consolidated with a love game for 4-1. Following a quick hold, Schiavone produced a backhand return winner crosscourt, a forehand winner and made Stosur err with the backhand to arrive at love-40. Later, by stabbing at a superb serve, Schiavone got a miscue on a short forehand from Stosur to get back on serve at 3-4. Despite the mounting pressure, Schiavone remained aggressive and comfortably maintained serve. Eventually, the set was settled in a tiebreaker. Schiavone secured a mini-break for 3-2 by tracking Stosur’s dropshot and converting a backhand up the line winner. The Italian extended her lead to 5-2 with a forehand volley winner and forehand crosscourt winner. Subsequently, with a crosscourt backhand volley winner, Schiavone obtained a second mini-break and four championship points. When Stosur’s stroke off the return traveled out of play, Schiavone bagged the second set and the French Open trophy. Schiavone rejoiced by painting her lips red with a clay kiss, duplicating this jubilant sign she had shown in the quarters and semis.